From meeting rooms, small classrooms and lecture halls, to auditoriums and theaters. Whatever the circumstance is, Panasonic offers a wide range of interactive projectors and displays that can transform static presentations and lectures into multimedia, collaborative experiences that will suit the environment. High definition displays. High impact Education and Presentation. Delivering Full HD image quality, the interactive displays include intuitive touch-screen technology, interactive whiteboard functionality and the latest wireless connectivity. Up to four people can work directly on the display. They can make notes, zoom, walk through presentations and even draw using an interactive pen or fingers. When the presentation or lecture is finished, capturing the work is easy as the interactive Series has a built in email functionality allowing users to send emails to group instantly. There is no calibration required for the range of interactive displays and they can be used without a PC, making them a flexible asset in the classroom or meeting room. Connect your video camera and write over the captured footage. You can also pause on a desired frame, take a screenshot, and make notes on the image. Perfect for a variety of applications, from strategic planning to video lectures. View documents and photos stored on USB memory quickly. Just plug in your thumb drive and tap on the USB Memory Viewer app. No time wasted, and a deeper, more effective presentation. To display hard-copy materials such as textbook pages, connect your document camera via the appropriate display input. High resolution, brightness, and contrast make for clear and comfortable viewing of text and diagrams. Easy Save and Share: produce up to 100 pages of work on the whiteboard save them to the built-in memory viewer or USB drive or sendthe files directly from the screen via e-mail. Interactivity isn’t restricted to just displays. 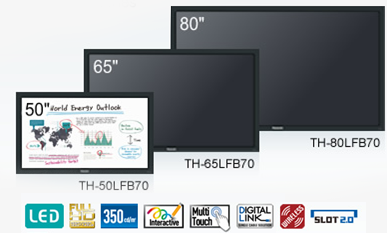 Panasonic’s interactive ultra-short throw and short throw projectors use infrared technology to provide the same capabilities as whiteboards, using interactive pens to write on the projected image and store notes or figures on a computer.